If you buy a new Mercedes-Benz A-Class, you’re getting an infotainment system more advanced and comprehensive than even the dearest Mercedes-Maybach S-Class. 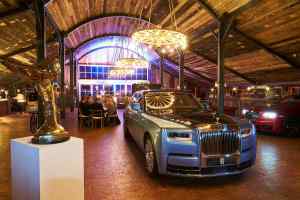 Infotainment has leapt up the order in car buyers’ priorities in recent years. And the top priority for many, looks? They’re still up to scratch on the new A, too. No, it’s not as pretty as its predecessor. That was a breakthrough car for Mercedes-Benz, its first small car to not look like a people carrier, and all the better for it. 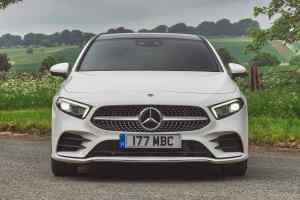 Design was what turned the A-Class into a top 10 best seller in the UK (favourable finance deals fanned the flames) – and Merc hasn’t reverted back to its old ways with this clean-looking new one. Brits love the A-Class. We’re the biggest market in the world for it, which is why we’re getting it at the same time as other left-hand drive markets. 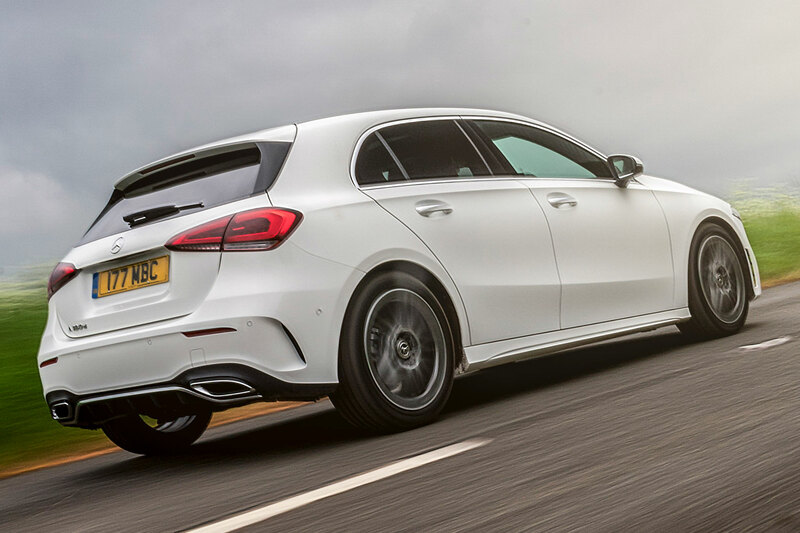 Often, there’s a delay, but Mercedes-Benz is swallowing the added production capacity to get the A-Class on UK roads. There are three engines at launch (more are coming), three trim lines, three key equipment upgrade packs. Endless happy hours on the configurator. 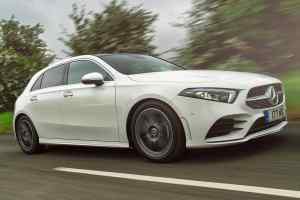 Active safety and semi-autonomous tech is filtering down from the S-Class, and the A-Class benefits from the same tireless development as all other Mercedes-Benz: that’s how you get the drag factor down to a class-leading 0.25 Cd, say the engineers. It’s the most affordable Merc, but not one that’s been developed on the cheap. Prices start from £25,800, which isn’t bargain-basement, but you’re getting a lot of well-developed car for the money. Plus, you get an automatic gearbox as standard, and the latest infotainment system and most of its functionality. 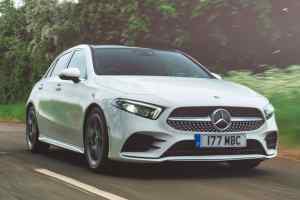 Compare new A-Class prices to the Volkswagen Golf: it isn’t as rich as you may think, and that’s before you factor in Mercedes-Benz’ typically sharp finance package. Expect all the marketing around it to be focused on its amazing infotainment system, and rightly so. But let’s not forget the rest of the car, which is looking to maintain its top 10 best-selling status in the UK and double down its advantage over premium rivals Audi and BMW. Time for a first drive. As with so many cars these days, you need to see the A-Class in the metal to get a feel for how it looks. 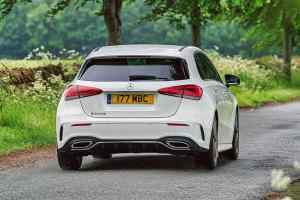 It’s more different to its predecessor than the images portray, with a rather cool quasi-estate look to its rear. The crisp side shoulder crease defines it, gently flowing back as if the designer’s felt-tip penstroke has been faithfully portrayed in metal. 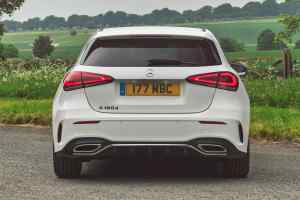 It appears more elegant than the sporty-looking old car, and details such as broader two-piece rear lights make it look more planted. The only strange aspect is the rather downward-facing angle to the nose. It’s as if some white space has been left above the headlights and grille, for some reason (the old A had deeper headlights which helped fill this area). 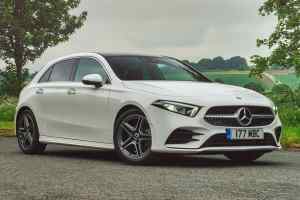 The neat cut of the bonnet though, pressed into the front end rather than perched on top, gives it a premium coupe look, as does the gently arched side windowline (more Shooting Brake than hatchback). All UK cars come with comfort ‘low’ suspension. It’s not a full sports suspension, but it still sits lower to the ground than European cars. This is a good thing as it means even base SE cars have a decent stance. Other nice touches include the door mirrors mounted within the shoulderline, rather than integrated into the windscreen pillar, and a less overt treatment for the lower ‘swoosh’ pressed into the side panels. Again, it looks classier as a result. 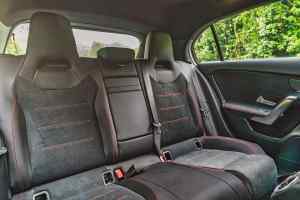 The interior of the 2018 A-Class is exceptional. It looks modern, feels premium, has talking points aplenty and will make you feel like you’ve bought something much more special than the norm. It is upmarket, and classy, and high-quality. It’ll be a talking point for everyone you show it to. The highlight is the instrument panel, freestanding on the main fascia. 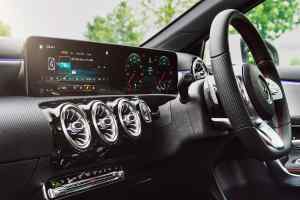 There are three grades, all fully digital: standard is 7-inch instrument and 7-inch touchscreen, the Executive option pack boosts the centre touchscreen to 10.25 inches for £1,395, and Premium takes the instruments up to 10.25 inches too, for £2,395. 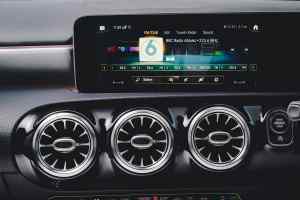 All use the same MBUX infotainment system, a generation on from that in the S-Class and others; all have a central touchpad which recognises multi-figure gesture (or a surprisingly effective touch-sensitive controller on the feel-good steering wheel), but all have Merc’s first touchscreen system for added simplicity. The basic setup isn’t a downgraded system. It’s smaller, yes, but the engineers promise processor speeds are just as fast in practice – maps zoom in and out smoothly, for example. They have artificial intelligence that learn your preferences, and natural voice recognition: instead of saying ‘Alexa’, say ‘Hey Mercedes’. 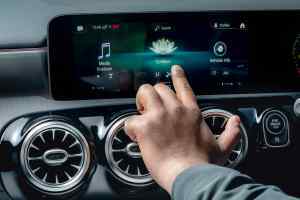 It’s an interface with no end of functionality, and Mercedes-Benz admits it will take time to dive deep. But it’s intuitive at the same time, much more so than the firm’s current system, so it shouldn’t be too baffling even for beginners. And the crisp, colourful displays look fantastic. The rest of it is modern, well-designed, creative. 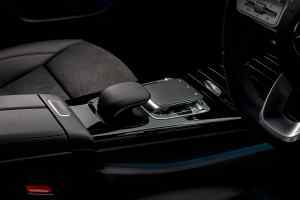 High-quality materials feel how a Mercedes-Benz should, and the design details such as the air vents, the doorhandles, even the new column stalks add flair. Choose an AMG Line and you get a cracking set of bucket-look seats. The driving position is generally good, and the firm seats supportive (you can mount them nice and low for a sporty feel), but it’s odd that a modern car should have pedals quite so offset to the right. 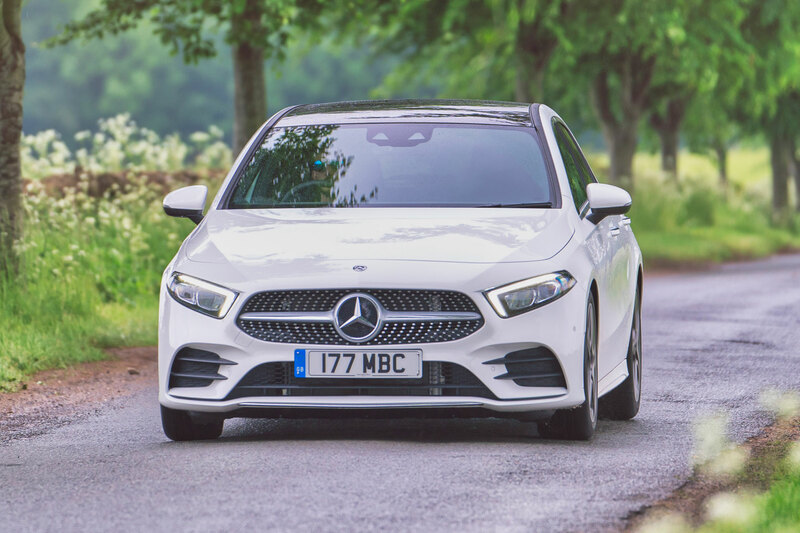 It’s easier to see out of than the old A-Class – the windscreen is wider and less cluttered, and the view past the windscreen pillars is clearer. Rear seat space is OK. The seat base is a bit low to the ground, so under-thigh support is lacking, and feet are a bit tight under the front seats, but kneeroom is fine. (Kids will love the dual USB sockets, which live in their own flip-down panel.) Boot capacity is improved to a class-competitive 370 litres, and the rear seats fold fully flat when lowered. 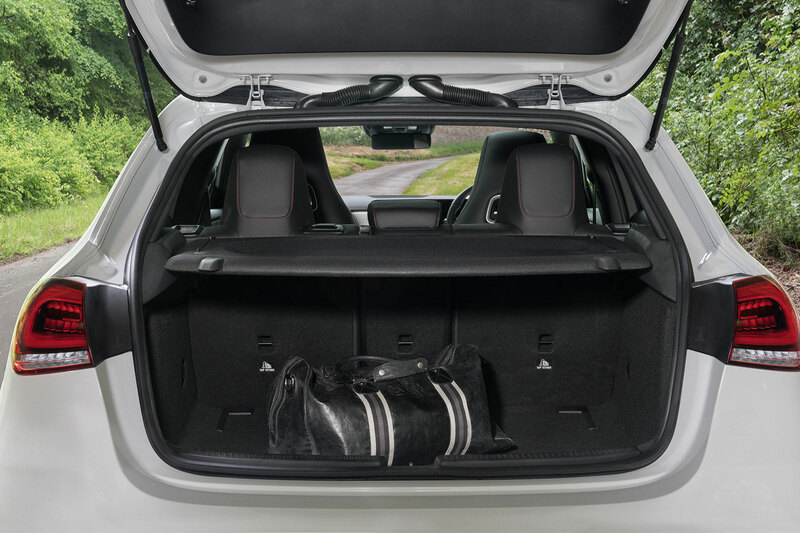 The opening is wider than the old car too: part of the lights live in the bootlid, so don’t get in the way when it’s open. Fleets will still err towards diesel A-Class, although private buyers are increasingly moving towards petrol. So we drove both. The A 180 d is a 116hp 1.5-litre four-cylinder co-developed with Renault-Nissan; the A 200 is, despite its name, a 1.3-litre four-cylinder, albeit one that produces 163hp. There’s also a 2.0-litre turbo A250 with 224hp. 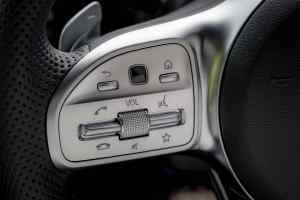 All A-Class currently have an automatic gearbox as standard. The 7G-DCT dual-clutch transmission is controlled by a stalk and is passable, but at times a bit indecisive. 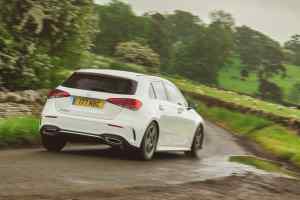 It’s better in the diesel than the petrol; the two engines, surprisingly, produce similar amounts of pulling power at, even more surprisingly, similarly low engine revs – but the diesel seems a happier partner to the gearbox. Not that the A 200 is without appeal. It’s very smooth and serene in everyday use, with a sweet nature and positive acceleration. It has cylinder deactivation during light running to save fuel, but you’d never know. It’s just the racket it makes when worked harder that lets it down: get it over 5,000rpm and it booms like a good ‘un, which soon chips away at the premium experience created by the cabin. If you use it mainly in town, or more sedately, it’s fine, and will prove very economical. If you often go further afield, or like to press on, consider the £1,500 or so on the A 250 money well spent. The diesel is the best all-rounder. In mixed driving, it’s much smoother and freer-flowing, with a more relaxed feel and laid-back nature. 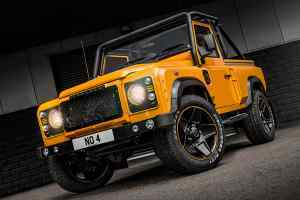 The gearbox doesn’t hunt up and down, and although there’s some of the diesel clatter in the background, it’s not objectionable and, overall, will prove more refined than the smaller petrol. That it’s marginally the cheapest A-Class you can currently buy is more reason to ignore the naysayers and go diesel. Both A 180 d and A 200 suffered from too much road noise at speed, and the suspension was audibly thumpy over rough roads as well (we even heard more than the odd trim creak, which was a surprise). Refinement was also spoiled by an unusual excess of wind noise from the rear cabin at speed; it was as if a window was left ever so slightly ajar. Both cars suffered from this oddly intrusive roar. 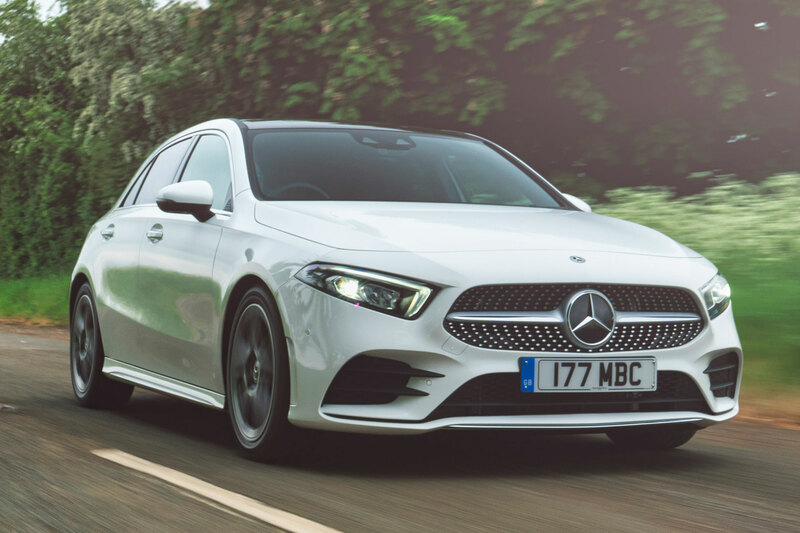 The A-Class is a clean, modern car to drive, with a stiff, confident feel to the front end that reassures you with its integrity. Not exciting, but satisfying. 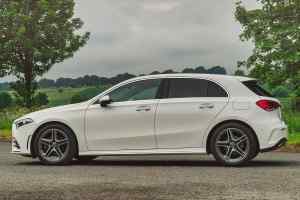 The ride was appreciably better on the SE-spec car with 17-inch wheels (actually an option: 16-inches are standard) than the AMG Line with 18-inches, though. It did still thud and bosh in town, but less than the AMG Line, and rarely suffered the trim-rattling crashes that could afflict the car with larger wheels. 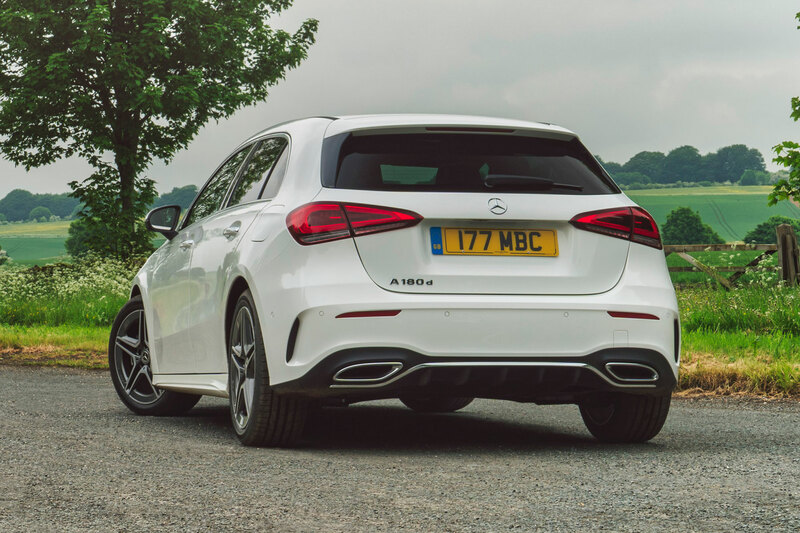 Purists will point out base A-Class (such as our A 180 d) have what’s called twist-beam suspension, with more powerful ones (or ones with bigger wheels, like our A 200 AMG Line) having a multi-link rear. Frankly, at this level, don’t worry about it. There’s little difference between them at this level of power: we preferred driving the supposedly ‘worse’ torsion beam here because of its better-judged rims. The choice of wheels will make more of a difference than your choice of rear suspension. The new A-Class is a good-looking car with a class-leading interior; we can see many people choosing it simply because of its brilliant infotainment system. Even if the rest of it were mediocre, the cabin would stand out. It’s better than that, though. Particularly the diesel. 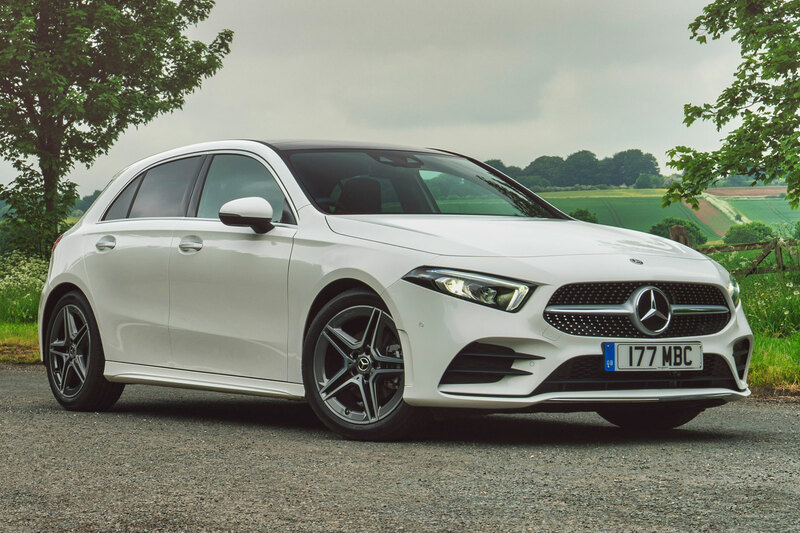 Choose it on mid-spec 17-inch wheels and you won’t have an exciting car to drive, but you will have a reassuring one, a car that feels authentically Mercedes-Benz. 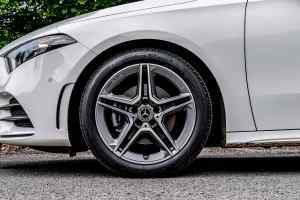 What a pity the AMG Line with 18-inch wheels doesn’t have the serenity of ride you expect in a Merc, and neither is as refined as they should be, either. 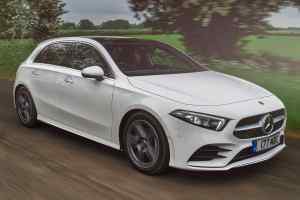 The new A-Class is still a credible car though, particularly with its newfound practicality and the mass of S-Class tech you can fit to it. 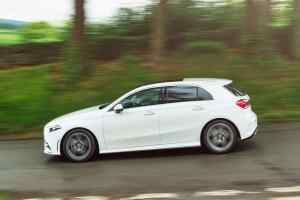 Even the AMG Line may later become a better choice, when adaptive suspension arrives on the option list. 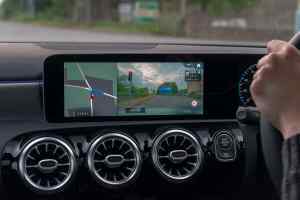 For now, we’d stick to a diesel Sport and spend the extra on upgrading the infotainment screen sizes. Your car will be the talk of everyone you take out in it for days.